Another question on my new 2006 A6 Avant - I cannot set the passenger and drivers blowers to different fan speeds. Either fan control changes both fan speeds the same. I have tried setting synchronise to OFF in the MMI. The driver and passenger temperatures and air directions do adjust separately. If it is possible to set the fans to different speeds, how? Ive noticed that too but never checked my manual..until now. Thanks so much. 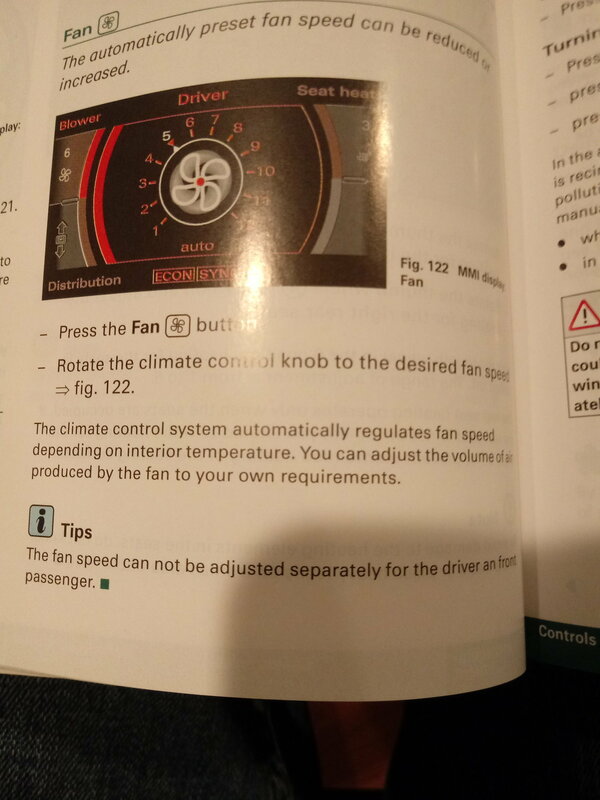 My manual has that image as Fig 175 on page 148 but no mention of only one fan setting! There is no way to set the fan to different speed for paassenger from the speed to driver. Changing the speed will change it on both sides equally. Only temperature can be set different for each side. 91CQ Heater blower making awful noise? Is it the blower motor going?